Getting it done before summer starts would require more than 650,000 workers, making the prospect infeasible, San Francisco-based Pacific Gas & Electric Co. said. "The scale of such a program would be unprecedented, and its costs are thus difficult to project," PG&E said, as it answered a judge's order calling for dropping wildfire risk to zero. "PG&E does not believe that it could assemble a workforce of such magnitude, as it does not believe that there are enough qualified tree trimmers and pruners available in the hiring market." The filing came after Judge William Alsup in U.S. District Court for the Northern District of California earlier this month said PG&E must reinspect its entire electric grid "and remove or trim all trees that could fall onto its power lines, poles or equipment in high-wind conditions," as well as branches "that could break off in high wind." Additionally, the judge said, PG&E needs to turn off electricity during high winds, regardless of upsetting customers or profit loss. The inconvenience caused, "irritating as it will be, will pale by comparison to the death and destruction that otherwise might result from PG&E-inflicted wildfires," Alsup said in his court order. Reliability and profits are important "but safety must come first. Only safe operation will be allowed," the judge said. Alsup is managing a criminal sentence against PG&E tied to a 2010 pipeline explosion in San Bruno, near San Francisco. That blast killed eight people. A different judge in 2017 put PG&E on five years of probation following conviction on pipeline safety charges. Alsup is looking at changing the terms of PG&E's probation. It takes place as PG&E warns it's ready to file for bankruptcy protection. The company says it lacks the funds to pay as much as $30 billion in liabilities tied to deadly wildfires. It plans to make the Chapter 11 bankruptcy filing by Jan. 29. California law requires a 15-day waiting period. A state investigation faulted PG&E power lines for sparking 18 fires in Northern California wine country in 2017. Now PG&E equipment is suspected of igniting November's Camp Fire north of Sacramento. That inferno killed 86 people and incinerated nearly 14,000 homes. The cause officially remains under investigation. Under California law, a utility is liable for property damage if its equipment caused a fire, regardless of whether there was negligence. However, the company also has had repeated safety failings. Fully complying with Alsup's order would range from $75 billion to $150 billion, the utility said. It estimated a cost of $1,250 per tree and removing 100 million trees. As PG&E lacks those funds, it would need to pass costs on to ratepayers, "an estimated one-year increase of more than five times current rates in typical utility bills," it said. That's assuming the $75 billion total. It would affect 16 million Californians. The utility in its response to Alsup pushed back against the idea of turning off its power when fire risk rises, saying it would create other perils. De-energizing power lines "is a tool of last resort because it presents significant public safety risks," PG&E said. "Shutting off power is not simply a matter of inconvenience. It is also dangerous — indeed, potentially fatal absent proper planning and the mitigation of unintended consequences," PG&E wrote. It can "leave communities and essential facilities without power, which brings its own risks and hardships." Moreover, following Alsup's order would mean overriding authority delegated to the Federal Energy Regulatory Commission and the California Public Utilities Commission (CPUC), PG&E said. PG&E transmission lines are part of a grid providing power across the West, as well as to Nebraska, South Dakota, Texas, Alberta and British Columbia in Canada, and Baja California in Mexico, the utility said. "De-energizing high voltage transmission lines as the proposal contemplates, particularly without the coordination necessary to do so safely, could threaten the stability of the electric grid both inside and outside PG&E's service territory," the utility said. The proper way to deal with issues is through existing federal and state regulatory processes, it said. One victims advocate questioned the cost estimate. The $75 billion to $150 billion "is ludicrous," given the utility averages about $215 million a year in vegetation management, said Patrick McCallum, a lobbyist who works with the California-based survivors group Up From the Ashes, and himself a survivor of a 2017 blaze. "We trust Judge Alsup to come up with a workable solution that focuses on safety for Northern Californians," McCallum said. PG&E's territory spans 70,000 square miles, one of the largest in the county. It includes tree-dense regions such as the Sierra Nevada foothills, said Peter Miller, director of the Western region of the Climate and Clean Energy Program at the Natural Resources Defense Council. Removing enough trees to eliminate wildfire risk isn't practical, Miller said. In addition, trees are needed for shade and shelter and to reduce greenhouse gas emissions. "Many of the beautiful communities in Northern California will be denuded," Miller said. A comprehensive approach to cutting fire risk is needed, he said. Studies are underway that look at putting power lines underground and other solutions. As well, S.B. 901, legislation passed last year, directed utilities to develop wildfire management plans and file those with the CPUC. "A big part of this is going to be how we build homes" and making those more fireproof, Miller added. 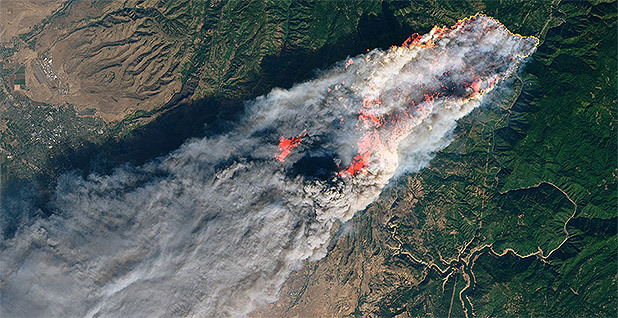 PG&E is failing to look at the big picture, said Michael Wara, director of the Climate and Energy Policy Program at the Woods Institute for the Environment at Stanford University. The utility is accurate in its filing that there are legal restrictions against some changes the judge wants, Wara said. However, PG&E could have said it would submit a plan to fix the problems to the CPUC. The status quo isn't acceptable given the scale of recent wildfires, Wara said. "What has gone on is intolerable," Wara said. "The idea that PG&E wouldn't consider radical changes to what it is doing that's leading to these catastrophes seems rather odd, given where the catastrophes have landed the company." It's not as if PG&E is financially healthy and rebutting Alsup's order, Wara said. "The company's about to file for Chapter 11 because of disasters that were caused by its equipment." A prudent manager, he said, would see that "they have to take evasive action at some point." The utility's CEO, Geisha Williams, left earlier this month. Executive Vice President and General Counsel John Simon was named interim CEO. There's "a leadership vacuum," Wara said, and the utility's filing to Alsup likely reflects the company's prior attitude of resisting large-scale changes. Wara argues PG&E must get a system in place to shut off power during high-wind events. San Diego Gas & Electric Co., a subsidiary of Sempra Energy, has that in place. It would be more disruptive in PG&E territory, however, Wara said, as there are taller trees and more rural homes. PG&E otherwise could face $30 billion in fire damages annually, Wara said, which isn't sustainable. "I don't see how they stay alive if they don't move in the direction Judge Alsup is articulating," Wara said. "I have not heard another strategy." PG&E could reduce impacts on customers by installing microgrids, battery backups and storage in high-risk areas, said Ethan Elkind, climate research fellow at the University of California, Berkeley, School of Law. Alsup last week in a proposed ruling also said that "the single most recurring cause of the large 2017 and 2018 wildfires" tied to PG&E's equipment "has been the susceptibility of PG&E's distribution lines to trees or limbs falling onto them during high-wind events." He asked the utility to respond to that finding. PG&E said that in terms of the October 2017 Northern California wine country fires, the investigation by the California Department of Forestry and Fire Protection (Cal Fire) said that 13 started "when vegetation contacted PG&E's powerlines." The investigation found that "the ignitions were wind driven and that the wind caused vegetation to break and fall," PG&E added. Cal Fire, while still investigating November's Camp Fire, "has identified two potential ignition points, one of which could involve vegetation contacting powerlines," PG&E said. "More generally, however, PG&E does agree with the Court that vegetation presents an acute risk of wildfire ignition across PG&E's service territory," the utility said.